The Black Lives Matter activists and anarchists, the socialists and anti-fascists, the religious leaders and local residents who risked their bodies and their well-being in Charlottesville this month should be celebrated for their courage and praised for their good sense and smart tactics. Violent fascists, neo-Confederates, Ku Klux Klanners, and other racist extremists don’t care about justice or civility or our common humanity. Their express aim is to annihilate anyone who isn’t white, straight, and Christian. And they have made it clear that they are willing to use raw and murderous force to get their way. How can such people be defeated unless they’re challenged everywhere, always, wherever they show up, whenever they try to “speak”? How will their ideas be rooted out unless fierce dissenters fight them in the streets and in the schools, in the workplace and in the halls of power? The activists who showed up in Charlottesville understand these questions and have made their commitment. They paid in blood for their beliefs. And it has counted, it’s counting now. Heyer’s sacrifice, and the stand that so many of her collaborators and comrades made in Charlottesville, exposed yet again the far right’s homicidal hate and helped accelerate the backlash against the symbols and purveyors of white supremacy in this country. It invigorated an already-potent movement that first burst into national consciousness when Bree Newsome ripped down the Confederate flag fluttering over the South Carolina statehouse in 2015 and that has since gained momentum as groups like Take ’Em Down NOLA force the removal of Confederate statues in the Deep South. Such monuments are being toppled and defaced at a quickening pace. The names of brutalizers and racists, from Robert E. Lee on down, are being erased from public space. Decent people everywhere are realizing that only engagement, action, and organizing can adequately counter the emboldened Nazis and their sympathizers in Washington, DC, and in the White House. Nowhere is this anti-racist activity more hopeful or more promising than in the urban hubs of the South itself. From New Orleans to Durham, from Birmingham to Houston, progressives and leftists, led by people of color, are resisting both the historical remnants and present manifestations of the authoritarian racism that has always seethed within this nation. In the wake of the Charlottesville violence, cities, states, and civil-society groups from coast to coast have doubled down on their drive to expel Confederate iconography from their streets and parks and public buildings. 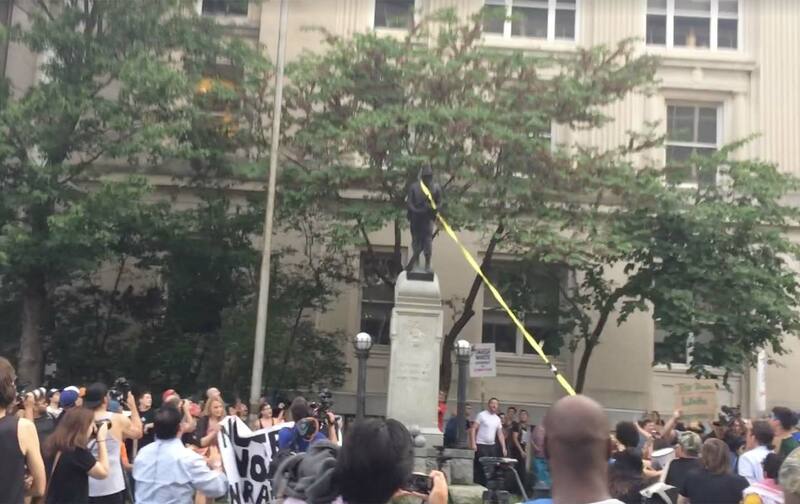 In what was perhaps the highest-profile incidence of statue toppling, a large group of outraged residents pulled down a statue of a Confederate soldier in Durham, North Carolina, on August 14, just two days after the racist rally convened in Charlottesville. It was a bold act of anti–white supremacist sabotage, for which police promptly arrested some of those involved, including 22-year-old student activist Takiyah Thompson. To show solidarity with Thompson and her fellow monument slayers, scores of people showed up at the city sheriff’s office in the following days to turn themselves in for the crime of toppling a Confederate statue. That same day, in Gainesville, Florida, a century-old monument to Confederate soldiers was removed from the Alachua County Administration Building. And on August 15, city officials in St. Petersburg, Florida, took away a sign that marked the local Stonewall Jackson Memorial Highway. On August 16, the mayor of Baltimore got rid of a series of Confederate statues in a quick and decisive overnight operation while, just hours later, an Episcopal church in Brooklyn, New York, removed two plaques commemorating Confederate officials, including Robert E. Lee. And that was really just the beginning. On August 17, the Lexington, Kentucky, City Council approved a measure to remove a couple of Confederate statues from a courthouse in the city. On August 18, a statue of Justice Roger Taney, the key author of the Dred Scott decision, was removed from the Maryland State House, while that same day, the only monument to Confederate soldiers in the state of Montana came down from its public perch in Helena. A few days after that, on August 21, the University of Texas at Austin got rid of a small quarry’s worth of its own statues, including monuments to Generals Robert E. Lee and Albert Sidney Johnston. The list goes on, and it will surely grow longer in the weeks and months to come. Meanwhile, some cities are going even further. In New Orleans, artists and activists have been projecting a racial justice–themed slideshow of words and images at the site in the city where a monument to Robert E. Lee once stood. They are hoping to use this project to gather ideas from the public about new monuments and statues and images that can replace symbols of the Confederacy. And in Montgomery, Alabama, the Equal Justice Initiative has started construction on a memorial to the thousands of victims of lynching, along with an accompanying museum that displays the violent and hateful history of slavery, racial segregation, and white-supremacist terror. In May, Kaitlin Marone, a 31-year-old comedian, was driving around New Orleans when a police officer pulled her over because her car had a broken brake light. It was an inconvenience and an overall crappy experience, and shortly afterward she fixed the light so it wouldn’t happen again. It was cheap, and easy to do, and it gave her an idea. She went to her local chapter of the Democratic Socialists of America and suggested that it launch a new mutual-aid initiative of sorts. She suggested that the group start a free clinic for New Orleans residents who need to get their brake lights repaired. Her DSA chapter threw a fund-raiser and also solicited donations online. It brought in roughly $3,500 for the cause and then started advertising its services. On Saturday, August 26, in the sweltering Gulf Coast heat, the group held its first clinic on a busy street in the city. Fifty people showed up. They were offered a seat in the shade and a water bottle and relaxed as the DSA crew went to work on their cars. New Orleans DSA organizers are planning another brake-light clinic next month. They are also helping other chapters across the country set up similar solidarity projects of their own. Last spring, Texas passed SB 4, a deeply punitive law backed by Republican Governor Greg Abbott that seeks to prohibit sanctuary cities across the state and force local police to cooperate with federal immigration agents. It’s also what’s known as a “show-me-your-papers” law that allows cops to ask about the immigration status of anyone they detain. As Hurricane Harvey has forced families to flee their homes in Houston and other coastal cities, many have feared that undocumented immigrants will face a heightened risk of deportation should they call emergency services and seek help. But a federal judge on Wednesday, August 30, did his best to dispel such fears when he temporarily blocked SB 4 from going into effect as a lawsuit against it moves forward. The lawsuit, which was brought by a collection of cities, counties, and civil-society groups, is just one prong of a concerted grassroots campaign against SB 4. The federal judge, Orlando Garcia, cited the enormous public opposition to SB 4 in his ruling, writing that the “public interest in protecting constitutional rights, maintaining trust in local law enforcement and avoiding the heavy burdens that SB 4 imposes on local entities will be served by enjoining” portions of the law. The State of Texas and its governor have promised to appeal the ruling. The decision, nevertheless, is an enormous victory for immigrant-rights activists, who have been uncompromising in their denunciation of SB 4. And it comes as other Texas leaders have stood by undocumented people as they weather Hurricane Harvey. Indeed, Sylvester took his pledge a step further. A Harvard-trained lawyer, he offered to represent undocumented immigrants himself if they get caught up in the deportation system as a result of the storm. “I do not want you to run the risk of losing your life or a family member because you’re concerned about SB 4 or anything else,” he said. Randall Woodfin is a lawyer, a local school-board member and a young black progressive running to be the next mayor of Birmingham, Alabama. On August 22, the 36-year-old beat out a packed 12-person field, which included the two-term incumbent William Bell, to take the plurality of votes in the city’s mayoral primary. On October 3, he will face Bell, who came in second, in a runoff election. Woodfin’s strong showing this month was the result of a vigorous grassroots ground campaign that saw his team knock on roughly 40,000 doors in the city. It also stemmed from his boldly progressive platform. Woodfin is calling for tuition-free community college in Birmingham, the creation of a jobs program to provide summer employment to all young people between the ages of 16 and 18, and a large investment in transportation infrastructure. This vision for the city has earned him the crucial backing of Our Revolution and its president, Nina Turner. Woodfin believes local races like his are the way the progressive left begins to take back power, especially in the South. “The South has something to say,” says Woodfin, riffing on a famous quote from the hip-hop artist André 3000. “Just like in Jackson Mississippi, when Chokwe Antar Lumumba won, the South had something to say then. Each time a progressive candidate wins in the South at the local level, there is a ripple effect,” he says, that promotes and extends and emboldens the movement. Jake Bittle contributed reporting to this article.